kromega offer a range of 1/16th Inch Outer Diameter (OD) chromatography grade PEEK HPLC tubing*. The tubing has been manufactured to withstand the demands of high performance liquid chromatography, and is colour coded to enable easy identification of the internal diameter. The high quality, ultra-value tubing has been developed in response to customers demands for customer-specified lengths. the column to the detector. For connecting the autosampler to the column. For connecting the pump to the autosampler. For use on the pump outlet. For use on pump inlet or waste from detector. Also used for low-pressure applications. * Each length of tubing is priced by the metre – eg. When ordering 5 off part id A230013, you will receive a 5 metre length. ** Longest continuous available length of any peek tubing is 10 metres. kromega offer 4 IDs of PEEK flexi tubing. Available in red, striped red, yellow, striped yellow, blue, striped blue, orange and striped orange, the range provides a neat and tidy alternative to standard HPLC tubing. 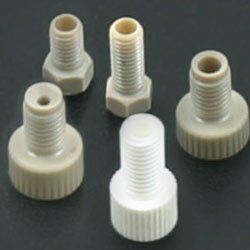 This kromega PEEK Fittings & Tubing Kit brings together a selection of commonly used parts needed for interconnection of HPLC system instruments. Ideal for running repairs or unexpected system changes – everything you need conveniently packed in a sturdy plastic case. All parts can be purchased individually, however, this kit offers considerable cost savings. Ideal for running repairs or unexpected system changes – everything you need conviently packed in a sturdy plastic case. For chromatography customers requiring complete chemical resistance we recommend the use of PTFE HPLC tubing* – chemically inert, non-toxic and bio-compatible. The tubing is available in a range of sizes and also for specific applications and uses (see table below). Jaytee offer the great value Kromega range of 1/16th Inch O.D. stainless steel tubing* for use with chromatography systems. Made from 316-type stainless steel as fitted by Original Equipment Manufacturers (OEMs). Available in popular internal diameters: 0.010″, 0.020″, 0.030″ and 0.040″. *Each length of tubing is priced by the metre – eg. When ordering 5 off part id A200013, you will receive a 5 metre length. To ensure leek-free connections, the tubing range also includes a dedicated tubing cutter. This Clean-Cut cutter makes burr free, perpendicular, non-distorted cuts to the complete range of PTFE & PEEK tubing. 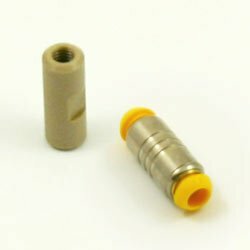 For tubing between 1.5 mm and 13 mm O.D.